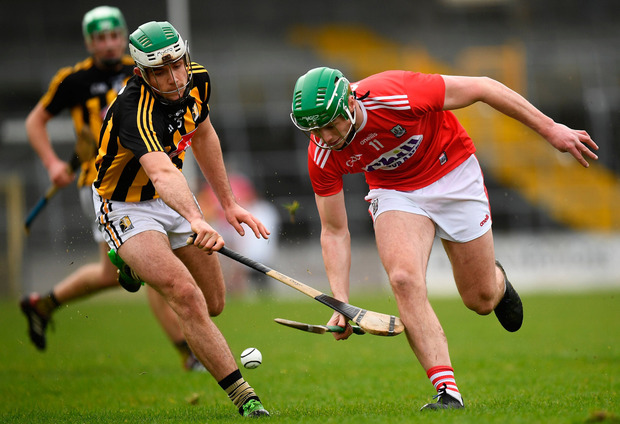 Business in the National Hurling League is done and dusted for this season for Cork and Kilkenny, and now it is full steam ahead towards the Munster and Leinster championships. 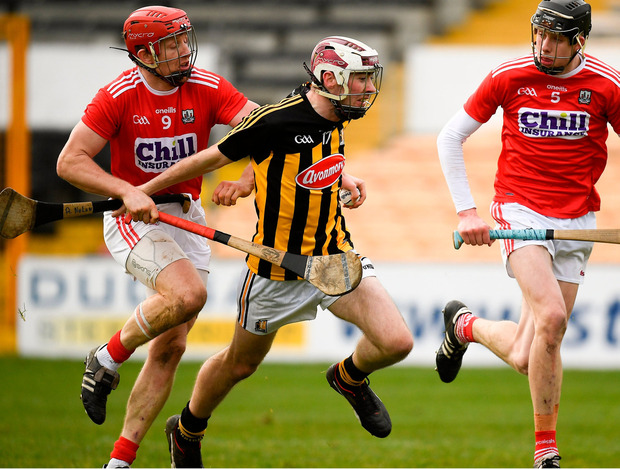 The pair played a low-key Division 1A relegation play-off tie before the smallest crowd of the season at cold Nowlan Park on Saturday. Cork won courtesy of a late blast of 1-2 which catapulted them over the line, thus qualifying them for Group A in next season's redrawn Divison 1. They will join All-Ireland champions Limerick, Tipperary, Waterford, Galway and Westmeath. Long-time leaders Kilkenny were felled by a late goal from sub Jamie Coughlan and points from Conor Lehane (free) and Mark Coleman, and they ended up in Group B, which includes Wexford, Clare, Dublin, Laois and Carlow. "We have eight weeks of hard work ahead of us now before we play Tipperary in the championship on May 12," said Cork manager John Meyler, who didn't make a lot of Saturday's match or outcome. Kilkenny boss Brian Cody made no bones about the fact that the Cats were disappointed about how the league went for them. "We didn't do well from a results point of view," he said after a mere two wins were recorded. "We would have been hoping to have done better. We got an understanding that we have a lot of work to do to prepare for the championship. There is a real battle ahead now." 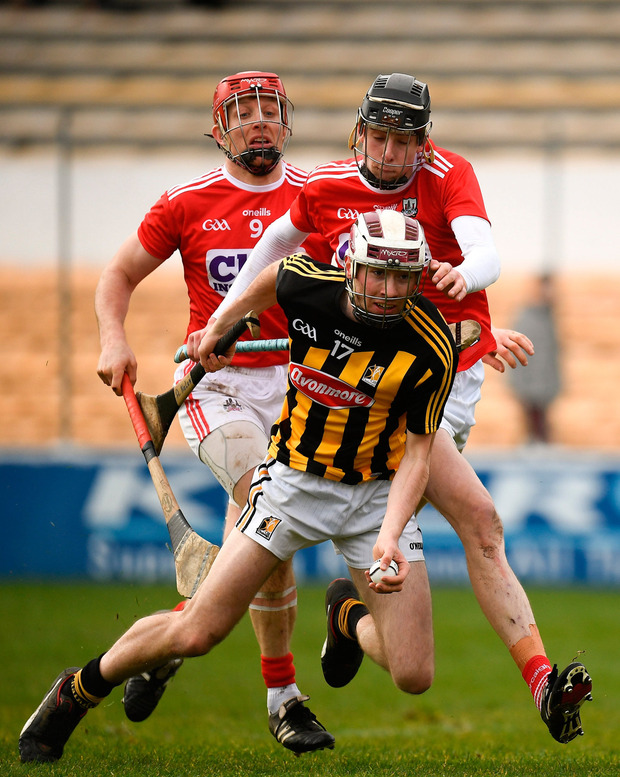 Wind-backed Kilkenny had Saturday's game within their grasp when James Maher and Richie Hogan shot points to take them 1-15 to 1-12 clear in the 67th minute. Cork, who clocked up 19 wides, suddenly found a golden touch between the 69th and 71st minutes and the three scores they unearthed won them the match. Kilkenny were 1-9 to 0-6 leaders when Richie Hogan slipped over an early second-half point. After that they were on the slide. Cork got level at 1-11 each when James O'Connor pilfered a goal, and their second goal was the clincher. Cork shot 11 wides during the first half. The only time they led was when Shane Kingston nabbed the opening point after 80 seconds. The Cats reached the break leading by 1-8 to 0-6. The goal was from a 33rd-minute penalty by Alan Murphy following a foul on James Maher. Two super saves by goalkeeper Eoin Murphy, from Shane Kingston and Conor Lehane, were huge for Kilkenny. Cork kept chasing after the turn, and they eventually got their shooting sights right. Scorers - Cork: C Lehane 0-8 (6f, 1 65); J O'Connor, J Coughlan 1-0 each; S Kingston 0-3; L Meade 0-2; M Coleman, C Murphy 0-1 each. Kilkenny: A Murphy 1-4 (goal pen, 2f, 1 65); R Hogan 0-5 (3f); N Brassil 0-3; R Leahy 0-2; J Maher, B Ryan 0-1 each. CORK - A Nash; S O'Donoghue, D Cahalane, D Browne; R Downey, T O'Mahony, M Coleman; G Millerick, B Cooper; C Murphy, R O'Flynn, L Meade; C Lehane, A Walsh, S Kingston. Subs: J O'Connor for A Walsh 45th min; D Fitzgibbon for C Murphy 45th min; J Coughlan for Kingston 68th min. KILKENNY - E Murphy; M Cody, P Deegan, C Wallace; E Morrissey, C O'Shea, T Walsh; J Maher, C Browne; P Lyng, A Murphy, R Leahy; B Ryan, R Hogan, N Brassil. Subs: A Nolan for C O'Shea ht; G Malone for P. Lyng ht; J Donnelly for A Murphy 52nd min; M Keoghan for Leahy 62nd min. REF - J Owens (Wexford).